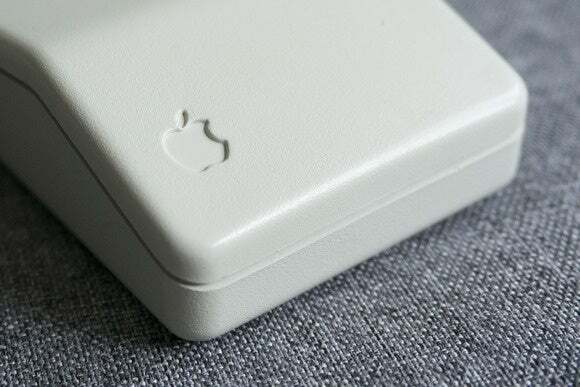 Apple is almost universally praised for how well-designed its products are—even if its detractors usually do so through gritted teeth while snarking about price—but one thing it’s safe to criticize Apple for, it seems, is its mice. I think that’s almost entirely unfair, and the only reason I say “almost entirely” unfair is because no matter how hard I screw up my eyes and try to expunge it from history through sheer force of will, the puck mouse which was introduced alongside the original iMac remains resolutely and undeniably a product that shipped. And it really was atrocious. In general, though, I like Apple mice. I happen not to use one at the moment because I use a KVM and you can’t pair the Bluetooth Magic Mouse with the KVM switch, but in general I think they’re attractive, comfortable and useful. My favorite of the vintage Apple mice is the one above, the Apple Desktop Bus Mouse. 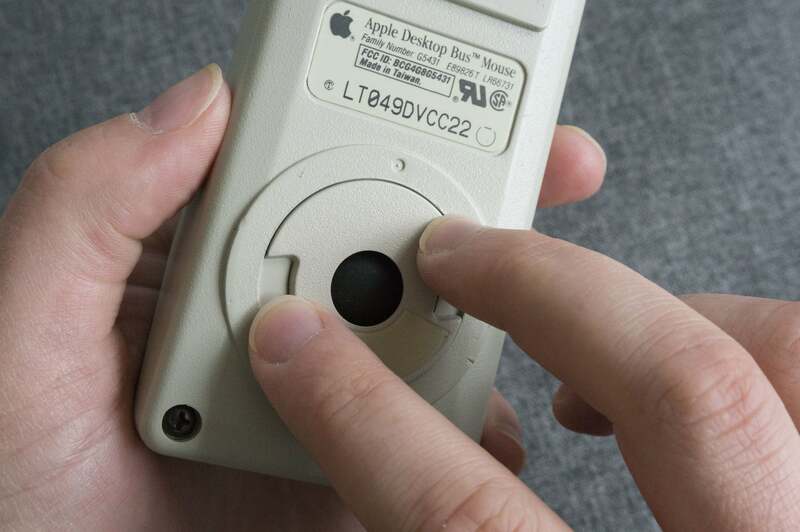 Although the first Apple mouse I actually used was its teardrop-shaped successor, the ADB Mouse holds a special place in my heart in large part because of how it looks. It was one of the first examples of the Snow White design language which Frog Design formulated for Apple, and to this day any Apple product created using its precepts looks exciting and considered, and has an aesthetic that is at once both grand and inscrutable, and inviting and friendly—the Apple IIc, the ImageWriter II, and the IIGS, for example. This mouse, introduced in 1986, has a gloriously sculptural, simple shape. Its unapologetically blocky, almost brutalist form looks terrific sitting on the desk, but once you’re holding it, somehow it feels completely natural and comfortable. There’s something honest and essential about it, and about how, in contrast to today’s solid surfaces and enigmatic features, the single mouse button is audaciously and conspicuously incised into its skin, sharply delineated as if to point out to people that here, this is where you press. I love the left-aligned, debossed Apple logo too. Today, everything is symmetrical, with any adornment studiously, slavishly centered on the face of Apple’s hardware. 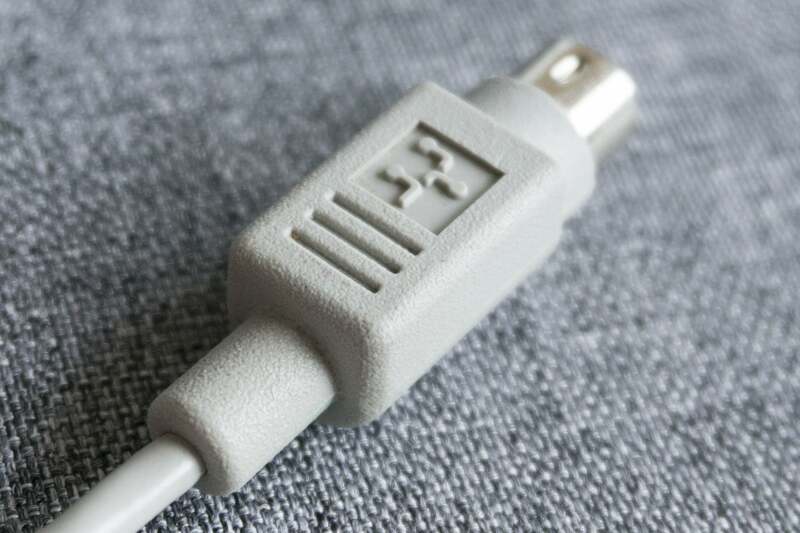 On this mouse, though, the simple logo—luxuriously, part of the actual manufacture rather than just being silk-screened on at the end—is knocked off-center, creating a playful tension on what appears otherwise to be quite a simple geometric shape. 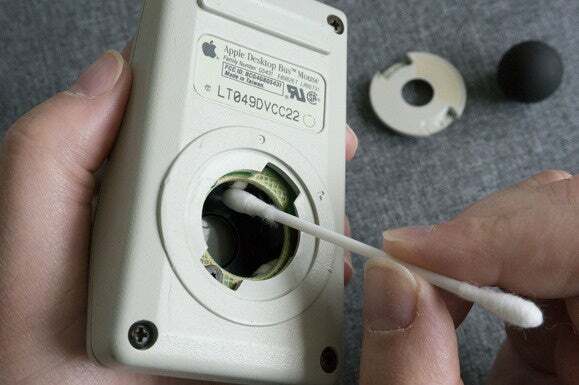 Unlike all of the mice Apple has made this century, this mouse, of course, didn’t have an optical sensor to report movement back to the Mac. Instead there was a ball under the hump of the mouse which, as you moved the mouse across the surface of the desk, rubbed against two wheels inside the body, one of which tracked left/right motion and one which tracked up/down motion. The basic idea was robust and worked well, but after a while it stopped responding as reliably. The pointer would move erratically or move so slowly that you ended up feverishly wiping the mouse repeatedly over your desk to get it to budge a few pixels. The solution was a ritual that we all used to do frequently, but which most of us won’t have thought about for a decade or more. You’d flip the mouse upside-down, twist the retaining ring to release the ball, then clear the accumulated gunk off the internal rollers. Often—disgustingly—you’d have to pick at the line of crud that had been deposited to dislodge it, then you’d blow into the cavity to clear everything away. It was quite common to clean the rollers with a moistened Q-tip as well, and if the ball itself had gotten caked with grime, you could take some sandpaper to it to scrape it off and re-roughen its surface. It was, for some, deeply satisfying, though, and in any case it was worth the effort. 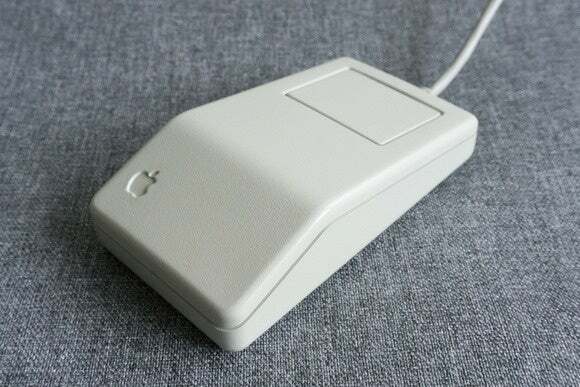 Unlike today’s anemic, whisper-quiet mouse clicks, when you had clicked this mouse, you—and everyone around you—_knew_ you had clicked this mouse. What’s more, you could argue that although today we’re enamored with right-clicking, Multi-Touch gestures, and Force Touch in the new MacBook, these advanced interactions are just troweling complexity and undiscoverability on top of the simple, powerful and elegant paradigm that is a single mouse button. This particular model, rather prosaically, was named after the new Apple Desktop Bus standard–the spiritual ancestor of USB, in some senses—which Apple used for a dozen years from 1986 for connecting input devices such as mice and keyboards to its computers. ADB itself has a surprisingly interesting story to tell, but we’ll save that for another day. What was your favorite Apple mouse—or trackpad? Which did you really hate? Let us know in the comments below, and share any stories you have about these humble little peripherals!